Geotechnical solutions specialist Keller has launched a new upgraded version of its GSM-2 datalogger called the ARC-1 Autonomous Remote Data Collector. As well as being able to remotely track pressure measurements, limit values, and fill and water levels, the ARC-1 now communicates via 3G and 4G mobile networks, enabling it to be easily located via its new radio modules. The mini SIM card has given way to a micro SIM card; the system status information, including battery status and signal strength, has been supplemented by a moisture sensor. A real-time clock (RTC) has also been integrated into the datalogger to increase accuracy. 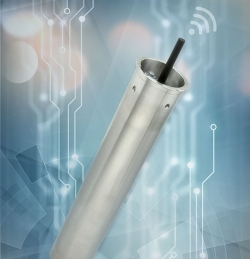 The new datalogger has not changed in appearance, measuring just 48mm (1.9in) in diameter, meaning it can be easily placed into the top of a 2in-wide sounding tube, which is standard in the groundwater measuring industry. The housing is designed to withstand condensation and temporary flooding, and the sealed antenna is covered by a lockable protective cap made of robust plastic. This protects the datalogger against theft and damage by people or wild animals when level measurements are being taken in the open countryside. Complete with energy-efficient electronics and a premium-quality lithium battery, the logger can transmit the results of 24 measurements every day by email, SMS or file transfer protocol (FTP) for up to 10 years. Its fastest measurement rate is one measurement per minute. The flexible, easy-to-use, open-source DataManager software covers the key functions of a monitoring, collection, control and organisational unit for the ARC-1. It collects the measurement data, assigns it, puts it in charts, reports any limits that have been exceeded, and stores it in an open-source mySQL database. Third parties can access the measurement data by means of various export and internet functions for integration into their own data collection systems. The DataManager software also enables users to fully parameterise and monitor each individual ARC-1 datalogger.